A little coyote given the nickname Tricky has really earned his title. After all, this lucky little devil not only survived being hit by a car, he also got a 10-hour joy ride from the Utah/Nevada border to Penn Valley, California. Perhaps he was inspired by the indestructible owl and wanted to take car destruction to a new level by adding an endurance challenge. Unfortunately we can’t ask him, because A) he’s a coyote and B) he escaped from Penn Valley’s Wildlife Rehabilitation and Release shortly after capture. 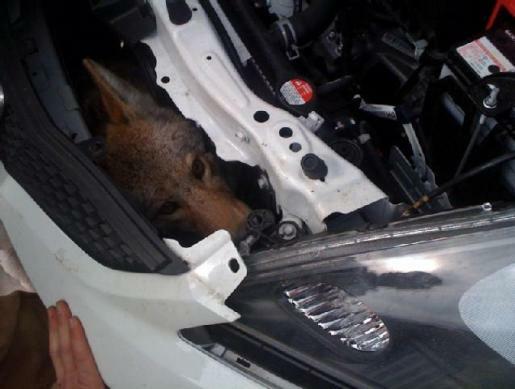 I can’t believe that Daniel East and sister Tevyn drove for that long with a fox stuck in the radiator of their car. I mean, I can understand not stopping once you hit the animal, especially if you think it’s deceased, but not stopping to go to the bathroom or get gas once on that trip? Or stopping and not inspecting your vehicle for damage?